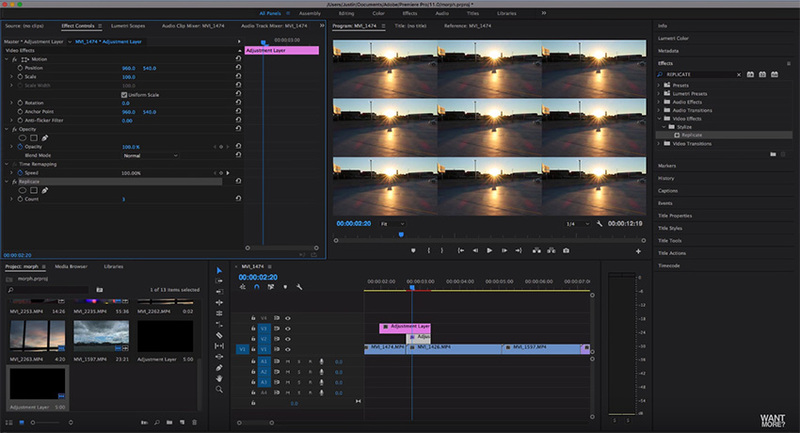 Even though Premiere Pro CC comes with a myriad of transitions and filters by default you can still create your custom ones to add some extra punch to your edits. An excellent example in that regard are the radial motion blur zoom in or zoom out effects. You have probably seen these multiple times in Sam Kolder’s travel vlogs, and if you wonder how to create such a transition on your own without using any complex third-party compositing applications, here’s an insightful video tutorial that covers the process in Premiere Pro CC from end to end. Sure, there is some prep work you need to do in advance, but once you’ve completed the suggested workflow you’ll be able to easily save those transitions as custom presets and apply them whenever you need. To start off, you should add two adjustment layers on the top of your edit. Next, trim the bottom layer and make sure that it starts exactly at the cut where the transition should take place. Now, you’ll have to apply some filters to those layers to create the actual effect. 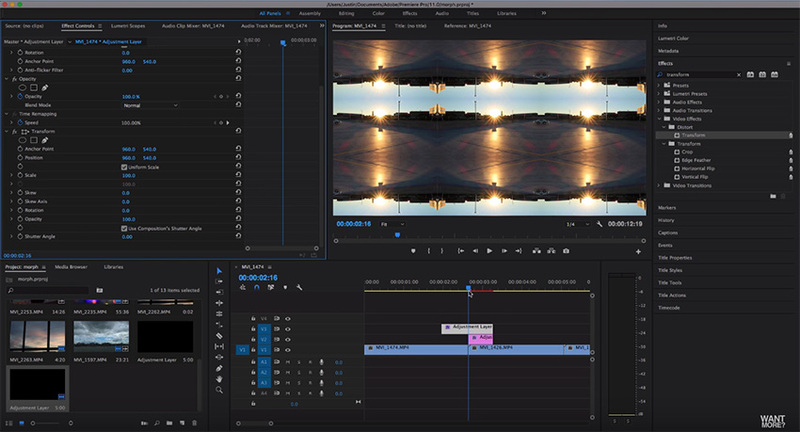 Head over to the Effects Panel of Premiere Pro CC and look for the Replicate filter. You should find it under the Stylize folder in the Effects panel. Add the effect on the bottom adjustment layer on your timeline, open up the Effects Controls panel and under Replicate alter the Count to 3 to get the following result. The main idea here is to blur the edges between the nine symmetric frames created by the Replicate effect so that when you zoom in or zoom out these won’t interfere with the image and will produce a smooth transition between the smaller shot and the actual size of the frame. You can easily achieve that by applying the Mirror effect to the same adjustment layer and changing the Reflection Angle and Reflection Center settings accordingly just as shown in the video tutorial above. Finally, to create the zoom effect, you’ll need to apply the Transform filter to the top adjustment layer. In essence, this step will allow you to get the smooth motion blur and zoom effect at the same time. For the actual zoom, you have to create only two keyframes. First, start at the center of the cut, move six frames backward and add a keyframe at 100% Scale. Then move six frames after the cut and adjust the scale to 300%. To get the blur effect you will also need to change the shutter angle to at least 300 degrees and disable the Use Composition Shutter Angle option. To fine tune the timing of the effect, open up the Scale drop-down menu in the Effects Controls panel and adjust the Velocity of the applied filter while trying to align its peak to the cut between the two clips on your timeline. In case you want to achieve the opposite effect, here’s the same workflow but applied in reverse. Personally, I certainly prefer the visual aesthetics that the zoom out effect adds to your video, but it’s totally up to you which one of the two you will opt for and implement in your edits.